دلاور, مجید, مرید, سعید, مقدسی, مهنوش. (1392). توسعه مدل بهینه‌سازی- شبیه‌سازی مبتنی بر ریسک تخصیص منابع آب با استفاده از مفهوم ارزش در معرض خطر شرطی، مطالعه موردی: شبکه آبیاری زاینده‌رود. 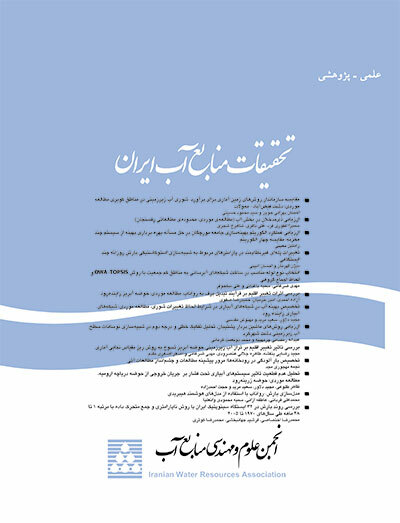 تحقیقات منابع آب ایران, 10(1), 1-14. مجید دلاور; سعید مرید; مهنوش مقدسی. "توسعه مدل بهینه‌سازی- شبیه‌سازی مبتنی بر ریسک تخصیص منابع آب با استفاده از مفهوم ارزش در معرض خطر شرطی، مطالعه موردی: شبکه آبیاری زاینده‌رود". تحقیقات منابع آب ایران, 10, 1, 1392, 1-14. دلاور, مجید, مرید, سعید, مقدسی, مهنوش. (1392). 'توسعه مدل بهینه‌سازی- شبیه‌سازی مبتنی بر ریسک تخصیص منابع آب با استفاده از مفهوم ارزش در معرض خطر شرطی، مطالعه موردی: شبکه آبیاری زاینده‌رود', تحقیقات منابع آب ایران, 10(1), pp. 1-14. دلاور, مجید, مرید, سعید, مقدسی, مهنوش. توسعه مدل بهینه‌سازی- شبیه‌سازی مبتنی بر ریسک تخصیص منابع آب با استفاده از مفهوم ارزش در معرض خطر شرطی، مطالعه موردی: شبکه آبیاری زاینده‌رود. تحقیقات منابع آب ایران, 1392; 10(1): 1-14. بحث عدم‌قطعیت و خطا در تصمیم‌گیری‌ها در مدیریت منابع همواره می‌تواند تبعات اجتماعی و اقتصادی جدی به همراه داشته باشد. این موارد می‌تواند ناشی از عوامل مختلفی مانند قیمت، عملکرد و پیش‌بینی جریان باشد که از این بین، مورد آخر بیشترین مشکلات را معمولاً به دنبال دارد. در این تحقیق تلاش شده است با استفاده از مفهوم ارزش در معرض ریسک شرطی (CVaR)، الگوریتمی به منظور تخصیص بهینه منابع آب در شرایط عدم قطعیت ارائه گردد. در این راستا یک مدل بهینه‌سازی- شبیه‌سازی با لحاظ شرایط کمی و کیفی آب ارائه گردید که قادر است، مقادیر بهینه تخصیص آب را در شبکه‌ های آبیاری، محصولات و مراحل رشد آنها با توجه به کمینه ریسک خطا در تصمیم‌گیری ناشی از پیش‌بینی جریان محاسبه کند. برای ارزیابی و بررسی روش‌شناسی ارائه شده از اطلاعات شبکه‌ های آبیاری زاینده رود طی سال‌های 87-1362 استفاده گردید. نتایج نشان داد که بهره‌گیری از مفهوم احتمالاتی CVaR در مدل تخصیص منابع آب، می‌تواند علاوه بر توصیف نحوه تغییرات ریسک پذیری سامانه در افق زمانی مورد نظر، میزان تخصیص بهینه آب را به گونه‌ای تعیین کند که خسارت وارده و ریسک ناشی از تصمیم‌گیری نادرست به‌واسطه شرایط غیر قطعی هیدرولوژیکی، کمینه گردد و در عین حال به نحو مطلوبی یک فضای احتمالاتی تصمیم را به منظور اتخاذ تصمیمات واقع بینانه در اختیار کاربر قرار دهد. Uncertainties and errors in water resources management decision making could result in the serious social and economical consequences.This can be caused by various factors such as price yield and iflow prediction that the latter usually has more complications, In this research it was attempted to present a water resources allocation algorithm under the uncertainty conditions using the concept of conditional value at risk (CVaR). In this regard' an optimization-simulation model considering water quality and quantity was developed which is able to calculate the optimal amount of water allocation in irrigation networks considering crops and their growing stages with minimal risk that resulting from uncertanties inflow prediction. In this study the information of Zayandeh­rood irrigation networks during 1983-2008 were used for assessment of this presented procedure.The results showed that using CVaR as a probabilistic concepti in water allocation model can determine both the system risk in time horizon and the optimal water allocation considering the minimal loss and the risk caused by uncertainty and also determine the good probabilistic decision space for users to make realistic decisions. دلاور م، مرید س، مقدسی م (1391) مقایسه توابع عملکرد محصولات و تخصیص آب آبیاری بر اساس روش‌های جدید و قدیم FAO در شبکه آبیاری زاینده رود. مجله تحقیقات مهندسی کشاورزی، شماره (2)13: 1- 13. فرشی ع ا، شریعتی م ر، جارالهی ر، قاسمی م ر، شهابی­فر م، فولادی س م (1376) برآورد آب مورد نیاز گیاهان عمده زراعی و باغی کشور. جلد اول گیاهان زراعی، موسسه تحقیقات خاک و آب. علیزاده ا (1380) طرح پروژه ملی (توتک) بهینه­سازی الگوی مصرف آب کشاورزی در ایران. سازمان هواشناسی کشور و وزارت جهاد کشاورزی. Akter T, Simonovic SP (2004) Modelling uncertainties in short-term reservoir operation using fuzzy sets and a genetic algorithm. Hydrological Science Journal 49(6):1081-1079. Andersson F, Mausser H, Rosen D, Uryasev S (2001) Credit risk optimization with conditional value-at-risk criterion. Mathematical Programming 89:273-291. Feinerman E, Yaron D (1983) Economics of irrigation water mixing within a farm framework. Water Resources Research 19:337-345. Ghahraman B, Sepaskhah AR (2004) Linear and non-linear optimization models for allocation of alimited water supply. Irrigation and Drainage 53:39-54. Huang YP, Li GH, Huang YF, Zhou HD (2009) A multistage fuzzy-stochastic programming model for supporting sustainable water-resources allocation and management. Environmental Modelling & Software 24:786–797. Jairaj PG, Vedula S (2000) Multi-reservoir system optimization using fuzzy mathematical programming. Water Resources Management 14: 457–472. Maqsood I, Huang GH, Yeomans JS (2005) An interval-parameter fuzzy two-stage stochastic program for water resources management under uncertainty. Eur J Oper Res 167(1):208–225. Mass EV, Hoffman GJ (1977) Crop salt tolerance current assessment. J. Irrigation and Drainage Division. ASCE 103:115-134. McNeal BL, Coleman NT(1966) Effect of solution and hydraulic conductivity. Soil Science 30:308-312. Moghaddasi M, Morid S, Araghinejad S, Agha Alikhani M (2010) Assessment of irrigation water allocation based on optimization and equitable water reduction approaches to reduce agricultural drought losses: the 1999 drought in the zayandeh rud irrigation system (Iran). Journal Irrigation and Drainage Engineering 59:377-387. Munns R, Termaat A (1986) Whole plant responses to salinity. Australian Journal of Plant Physiology 13:143-160. National Research Council (NRC) (2000). Risk analysis and uncertainty in flood damage reduction studies, Committee on Risk-Based Analysis for Flood Damage Reduction. Washington, DC: National Academies Press. Piantadosi J, Metcalfe, AV and Howlett PG (2008) Stochastic dynamic programming (SDP) with a conditional value-at-risk (CVaR) criterion for anagement of storm-water. Journal of Hydrology 348:320–329. Raes D, Steduto P, Hsiao TC, Fereres E (2010a) AquaCrop- The FAO crop model to simulate yield response to water. Reference Manual. Raes D, Steduto P, Hsiao TC, Fereres E (2010b) AquaCrop Reference Manual (Annexes) . Rockafellar RT, Uryasev S (2000) Optimization of Conditional Value-at-Risk. The Journal of Risk 2(3):186-190. Shao LG, Qin XS, Xu Y (2011) A conditional value-at-risk based inexact water allocation model. Water Resour Manage 25:2125–2145. Steduto P, Hsiao TC, Fereres E (2007) On the conservative behavior of biomass water productivity. Irrigation Sciences 25:189-207. Stefano P, Giovanni MS, Paola Z (2004) A DSS for water resources management under uncertainty by scenario analysis. Environmental Modelling & Software 20:1031–1042. Webby RB, Adamson PT, Boland PG, Howlett AV, Piantadosi J (2007) The Mekong applications of value at risk (VaR) and conditional value at risk (CVaR) simulation to the benefits, costs and consequences of water resources development in a large river basin. Ecological modeling 201: 89–96. Yamout GM, Hatfield K, Romeijn HE (2007) Comparison of new conditional value-at-risk-based management models for optimal allocation of uncertain water supplies. Water Resources Research 43(7):47-52.